Updated: If you’re a traditional journalist, or someone who works for a traditional media outlet, the easiest way to cast aspersions at a digital media entity is to use the A word: that is, “aggregation.” New York Times (s nyt) executive editor Bill Keller stayed true to form in a piece he wrote for his newspaper Thursday, in which he categorized The Huffington Post and other unnamed online media outlets as pirates, who are in the business of “counterfeiting” content rather than engaging in “real” journalism. In only a few paragraphs, the NYT editor managed to say volumes about how little he understands where media is, or where it is going. Keller’s piece starts out as a humble discussion of his status as the 50th most powerful person in the world (according to Forbes magazine) and how he thinks this is absurd, since he just runs a newspaper. But it quickly becomes a complaint about how members of the media — and assorted “flocks of media oxpeckers who ride the backs of pachyderms, feeding on ticks,” as well as professional pundits such as Clay Shirky and Jay Rosen — spend too much time talking about media in the abstract instead of doing it. Then he launches into an attack on aggregators, saying the media industry has “bestowed our highest honor — market valuation — not on those who labor over the making of original journalism but on aggregation,” an obvious reference to the $315-million acquisition of the Huffington Post by AOL (s aol). [T]aking words written by other people, packaging them on your own Web site and harvesting revenue that might otherwise be directed to the originators of the material. In Somalia this would be called piracy. In the mediasphere, it is a respected business model. This is where he calls out the Huffington Post, whose founder is “the queen of aggregation,” having discovered that “if you take celebrity gossip, adorable kitten videos, posts from unpaid bloggers and news reports from other publications, array them on your Web site and add a left-wing soundtrack, millions of people will come.” The NYT editor goes on to say that while AOL called the acquisition of Huffington Post a key part of its content strategy, buying an aggregator and calling it a content play is “like a company announcing plans to improve its cash position by hiring a counterfeiter.” (Update: Arianna Huffington has posted a response to Keller’s piece at her site). Keller seems to be missing the point that all media — both online and offline — is, to some extent, about aggregation. (He’s not the only one; the New Republic had a similarly wrong-headed piece about it recently). Even newspapers aggregate content from newswires and occasionally rewrite it to make it their own. Yes, they pay those newswires for the privilege, and so does the Huffington Post. The difference is that it pays in attention, which it directs back to the original source, just as Google pays with links when it aggregates content at Google News (s goog). According to a Huffington Post staffer, news websites actually beg the site to aggregate their content, since it gets more traffic. Aggregation is a term that covers a wide variety of behavior, some of it nefarious and much of it not. To take just one example, look at what Andy Carvin of National Public Radio has been doing by pulling in and republishing Twitter posts from hundreds of different people — both individuals and journalists, including New York Times writer Nick Kristof — as a way of covering the revolutions in Tunisia and Egypt. Is that aggregation? Sure it is (or “curation,” as some prefer to call it). Is Carvin not taking reports from unpaid bloggers and news reports from other publications and republishing them? Of course he is. But he’s also engaged in a very real form of 21st-century journalism. And maybe if Bill Keller spent a little more time trying to understand how aggregation works instead of railing against it, the New York Times would be a little further ahead in this new media game, instead of playing catch-up with Arianna Huffington. Quite good piece but I think Keller is quite right on whole thing. The fundamental issue is not on value but valuations but the big mistake, we all are doing is to take AOL valuation of HUFFPO as an act of God, a gospel truth! If one goes by history of AOL and even their own recent action of closing offices, firing employees and acquiring companies, one can fairly conclude that AOL with whatever traffic it has, got hardly any understanding of the business it is playing. AOL is acting like a frustrated blind folded rich brat with a loaded gun who is shooting left and right to figure out a way to which unfortunately it has no clue. These valuations are anything other than markings in sand and change overnight. Not many year ago, there was this merger and giant valuation created by AOL acquisition of Times Warner!!! Traditional media like the NYTimes are sugarcoating their dislike for aggregation with opinions like this. The reality is that aggregation poses a serious risk to another form of leverage they used to have – Slant. Exactly, and we see that aggregation is an obvious benefit to understanding, it’s what our P2P world affords us. Opposition seems based on money not utility; makes one hopeful that an attribution system can soon be sorted, it’s in place in other media channels..
A complicated issue where both sides touch on an element of truth. I imagine there is a fine line between content farming and engaging in 21st journalism. This is an issue we are all still trying to figure out. I hate The Huffington Post and never look at it anymore. And I do think it’s robbed content from other publications. That said, this is the media marketplace that’s evolved, and Bill Keller (and Times publisher Arthur Sulzberger) is fighting a battle that was over several years ago. While I can respect the way he wants to define what journalism is, he’s living in denial if he doesn’t see the value of aggregators. They’re two different issues. Anyone who owns a Web site knows that when one of these hot “ticks” links to you, it’s like traffic gold. Traffic for a mainstream newspaper means revenue. Now if his issue is that the world should all just go to the NYT every day and not bothering with anything else, then he’s doomed to dinosaurhood. People generally start by their content discovery process via a mechanism that aligns with their interests, whether it be Huffington or their Facebook news feed. If I took a Seinfeld episode and cut it down to the five funniest jokes – and maybe added a bit of commentary – and posted it on my website, would that add as much value as the original episode? Could I have done it without the creativity of Seinfeld’s writers? As I see it, the only value I’d be adding is giving people without a spare 30 minutes to watch the show a feeling that they’ll still get the jokes at work the next day. I’ve created nothing original. The same with the sites Keller is talking about. They’re a convenience. But at what cost? You may not think old media is really tottering, but it is. The layoffs, furloughs and bankruptcies aren’t for show. Wall Street is a harsh mistress, and most news creators are beholden to stockholders – when the profit drops, so does the ax. I’m not saying newspapers are entitled to money simply by virtue of being newspapers. But think of it this way: how many innocent men has HuffPo freed from death row? Would anyone in GigaOM’s organization know what to do with a Wikileaks data dump? How many people from your organization are in Afghanistan right now? Libya? Washington DC? Yup, this about nails it. The day “Giga OM” has a reporter in Libya doing real work – instead of just leeching off the places that actually DO have REAL reporters there (and not just some guy with a smartphone taking pictures and calling it “journalism”) is the day pigs fly. Are you new to GigaOM, Rob and Joe? Why on earth would a tech news site have reporters in Libya and Afghanistan? Looks like you’ve missed your way en-route to a politics news site. More importantly, GigaOM writes a lot of original pieces and analyses — including video. Please keep the conversation intelligent and quit trolling. I think you’ve inadvertently provided a much easier and more amusing way to distinguish between real and fake journalists, by revealing that you don’t know the difference between a journalist and an editor…. Last time I checked, Ian, an editor *is* a journalist if he/she is curating news. We collectively have a broader definition of journalism today, one that is moving and shifting before our eyes. At its core, though, there are different ways to produce journalism including original reporting and curation/aggregation (a collection of reporting and perspective). There is good aggregation and bad aggregation, just as there’s good reporting and bad reporting — and that’s true on all platforms. Totally agree — thanks for the comment, Andrea. Wait… seriously? You can’t think of a single counter-example to that statement? The bottom line is that content aggregators rely on other people to generate content – that way there’s something to aggregate. Ideally, content aggregators would be willing to pay content generators for their content. In reality, no single aggregator is willing to pay for content because once the content is on the web, all the aggregators will benefit. It’s called a tragedy of the commons, and it’s a tragedy because we all end up with an infotainment echo-chamber instead of actual insightful journalism. So it’s all or nothing? Either you are the New York Times, or you offer NO value of any kind? Why do we have to reduce this to a simplistic binary? Binary – is that the latest hipster word Carrie? It’s definitely not binary. Aggregators provide value, and content generators provide value. The point that I want to get across is that aggregators are making money and content generators aren’t. It’s a problem, and I think Mr Ingram should be recognizing that it’s a problem instead of fueling a flame war between aggregators and generators – two groups that should be working together. This Joe guy is full of nice compliments. As a PhD I’ve been called a nerd, pointy-headed, and a geek, but can’t say “hip” usually comes to mind! But I’ll take it. Actually, Peter, the reality is that we end up with media outlets that both aggregate and do original reporting — as both the NYT and the Huffington Post do. It’s not either-or. I agree – that’s the direction that we’re moving. However, that’s not necessarily the best direction. I think that we’re all better off in a world with independent content generators – not just ones hired by aggregators. 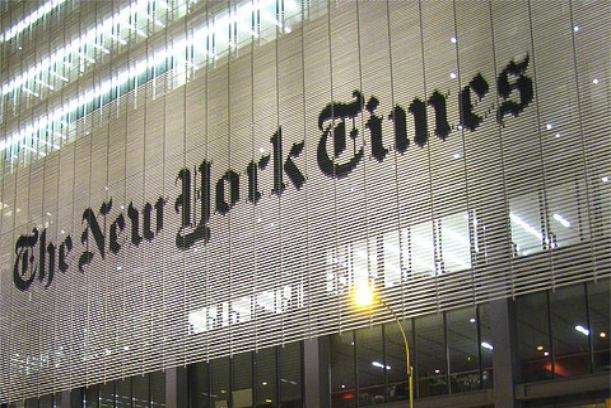 I’m not siding with the NY Times on this… I’m just saying that the NY Times has a valid point. There IS a business model problem and it’s preventing content generators and investigative journalists from making a living – and that’s not good for anybody. Mathew, I’ve really enjoyed following you on Twitter. Keep it up. I don’t get the conversation here about valuations though. AOL stock is crashing and although NYT isn’t exactly doing an Apple it is valued 50% more than AOL and did make more than $100 million profit in 2010. Great point, Gregg — thanks for the comment. Re: “Someone will always do the reporting” – not if they are paid slave wages like HuffPo, Patch and all the other content farms do. Good journalism takes time and costs money. Something your crowd wouldn’t know anything about. Good luck to the cover bands, which is what I call aggregators, when google finishes up their algorithms to rightly cast them – including this site – off into never never land. Big fan. First time poster. Longtime reader of your comments. No one builds rhetorical walls like you, Joe. You’re Dana Carvey doing George HW Bush. But most metro dailies have relied for decades on wire content, syndicated content that is a combination of work produced by AP staffers, who often covered huge areas for little pay and wrote for several types of media in a day’s work. Or, AP (UPie, AFP in Europe, Africa, etc.) might take their content from member newspapers without passing on a dime to the original reporter. She or he made a salary for their original paper and that was good enough. So, if HuffPo is providing slave wages, why do people contribute? Isn’t it because their play does not depend on the aggregator as their main source of income? They have another blog or a pundit’s career or an acting career that really pays them. They rely on the aggregator to bring prestige or notoriety or whatever you want to call it. Don’t hate the aggregator. The aggregator is you, metro daily. The Keller piece just seemed…odd to me. Like he just had a really bad day and dashed off something half-baked. To begin with, I mean sure, I’m from the Midwest, and I love me some humility like nobody’s business, but look, Keller, you can’t feel proud of the impact your organization makes on the world through its excellent journalism and at the same time argue that, oh, little old me has no power, I shouldn’t be held up by anybody as important! Journalism basically defines itself and its privileges in our society because it is a critical pillar of a democratic society – but with that power does, yes, come accountability. Yes, we should scrutinize the media thoughtfully and carefully – that’s the job of any citizen – and yes, we DO need some specialists and experts who devote their lives to understanding media, just as we do for any important institution. The truth is, decades of research plus basic common sense tells you that the Times a makes people aware of things they need to know and wouldn’t know otherwise. That is incredible power. I sympathize to the whole “if everybody is aggregating, who is producing good, quality content” argument, but at the same time, this feels like feeble lashing out here. Even if you don’t like the Huffington Post, the idea that it offers NO original journalism and NO contribution to society seems to me to be more than a little extreme. And the truth is – there IS a lot of smart material being produced out there, every day, more than most of us can possibly consume, and not all of it unsourced drivel or opinion – and if you STILL haven’t come to terms with that idea and you honestly believe that ONLY people who work for news orgs like the NYT with big salaries can produce news – you are just so far behind the times. Is it possible he’s so far behind? Sorry, that was a long rant. Thanks for the incoherent ramble of a, I think, putdown of Keller. Your 20something hipster crowd just LOVES to put some words in CAPS doesn’t it to make a POINT, doesn’t IT. Your LINE of LOGIC is this essentially: I don’t need farmers because I can get all my food at the grocery store. Joe, if you can’t be civil in your comments, then please take them elsewhere — Carrie is a journalism instructor and knows a fair bit about this topic, so do us and yourself a favor and either make a substantive argument or move on. Keller is right. You’re just another aggregator Giga. dude. huffpo is shameless. it’s not the only one in the ‘repeater not reporter’ game, but it’s one of the worst. keller is right. and you know what happens when the original sources of the stories huffpo is “curating” disappear? the huffpo writers will have nothing left to aggregate. they might have to do some actual reporting. I doubt many of them know how. People keep throwing out the “what will happen when the sources of original reporting disappear” idea — it’s not going to happen. It’s just a bogeyman that media outlets use to try and scare people. There will always be original reporting, whether it’s done by the Huffington Post or individual reporters or bloggers or the New York Times. less and less and less of it over time, because nobody is paying for it. the ny times, the washington post, the wall street journal, cnn — they will probably survive in some attentuated form. the rest? not very likely, if sites like huffpo continue to take their traffic and their ad revenue. the boogeyman is real. and if you don’t beleive me, look around at all the ex-journos now doing corporate work or PR or working behind the counter at starbucks. Agreed, but in what form? From whom? And will it have integrity? Who is going to do original stories on serious social issues? And who is going to do investigative pieces, which are hugely labor and money intensive? Huffpo expects everything for free, and independent reporters and bloggers simply don’t have the resources to cover these things. I think it’s naive to think journalism isn’t going to be seriously compromised if we continue trying to compete with the lowest common denominator. You can’t adapt to FREE. Bravo, Mathew! Excellent post! And so bang on. There is a valuable distinction to be made between journalism, which is original reporting of news, and aggregation, which takes various sources of original reporting and repeats it. The New York Times, Washington Post, NPR, and even GigaOm, engage in original reporting on news and issues. The HPost simply takes that reporting and re-posts it. That may be a worthwhile service, but it is not journalism. Without real journalists, there would be little value for aggregators to aggregate. There is a valuable distinction to be made, Zedd — but the reality is that both the New York Times and the Huffington Post engage in both of those things you describe. The Times does aggregation and the HuffPo does original reporting — it is all part and parcel of journalism. This is disingenuous statement because it would still be true if the Times published one aggregated story and HuffPo published one original story. The truth of the matter is that The Times has 1100 journalists on staff who job it is to write original stories. HuffPo has stringers who get paid nothing (including a number of friends of mine). The point to be acknowledged is that The Times’ mission is to publish original stories and photographs as part of its responsibility as a institution of the Forth Estate (hopefully making some money along the way). HuffPo’s mission is to take those same stories and monetize them. Fantastic article, Matthew. In my mind, it’s all about providing value to the readers. Whether that’s based on content aggregation or 100% unique content is somewhat irrelevant. Usually a healthy balance of the two is best. Making such bold statements does little more than to tarnish the image of the NYT. Often times acting defensive signals something much more… and that’s exactly what we see here. Thanks, Rob — I totally agree. Wait, a reporter does a lot of work on a story, paid for by his/her company, and someone else comes along and basically copies all that work for nothing? Easy to provide value for cheap if you’re copying someone else’s work. Much of the aggregation play is that, essentially. Is it not? @Gabriel – The lion’s share of content being rewritten isn’t coming from long, extensively researched topics but instead quick blips that take place on Blogs, Twitter, YouTube, Facebook and beyond. And many of the accused “aggregators” aren’t simply republishing content – they are offering their own thoughts, opinions, and style – this is often the reason readers keep coming back. Further more, if those doing the “aggregating” are also properly citing and providing links to the original source, than natural click throughs and Google’s Algo among other factors should keep the benefits of valued journalism in balance (thereby protecting the original source). Old guard media need to realize its a fast paced world where news has changed. Likewise, the “aggregators” need to realize if they don’t have a unique proposition for their readers, their reign could be short-lived. Yeah Keller was a bit hard on the Huffmistress but come on: you could curate tweets for 1000 years and you’re not adding as much journalistic value as Kristof added in one day on the streets of Cairo reporting from the revolution. And while it may benefit a minor-league site to be aggregated by HuffPo, everyone already knows that the New York Times is there. Certainly some number of readers will get enough from the HuffPo remix to eliminiate the need to go to NYTimes for the real deal; it’s not clear to me that it’s a net win for them like it would be for an unknown upstart. Thanks for the comment, Jeff — the point isn’t whether Nick Kristof or other writers provide valuable journalism or not. Of course they do. And it’s not whether the NYT gets any value from being aggregated by the Huffington Post (which it likely does, regardless of how popular it is). The point is that aggregation occurs throughout journalism, both online and offline, not just at the Huffington Post, and it’s disingenuous of Bill Keller to pretend that one kind is piracy and the other kind is journalism. I don’t think Keller is that off-base. I don’t think it’s that curation isn’t a form of journalism, but he hit the nail on the head when it comes to valuations. The NYT should be infinitely more valued than HuffPo. Even thinking of your own pieces; how many times do you source the NYT compared to HuffPo? The simple fact is that the stories that are being analyzed are coming from the journalism from the old-school media, no matter how digital is reworking it. It’s one of the reasons I love working here so much. Reporters still get on the phone and talk to people and use additional sources and don’t write from an old-media piece or a press release. But the huge valuations are going to the rebloggers and the aggregators and not the ones creating the content that’s actually being reblogged and aggregated. HuffPo would be nowhere if it wasn’t for those publications still going out and digging up the stories that are out there. Journalism is looking more and more like a dying art, and the question everyone should be asking is what’s going to happen to all these curators and aggregators when that original content disappears because of the broken business model? Right on Cyndy. Writing a ’round up’ piece that strings together pieces of original coverage from ‘real news’ orgs doesn’t add that much value. Doing real reporting is critical to society’s function. How can journalistic value earn the appropriate market value? Perhaps Keller is frustrated becaue this has been such a vexing problem, but I can certainly understand why he doesn’t want others to profit off the NYTimes’ original reporting. Its a question that I am afraid to ask, as I have watched opinion be mistaken for fact, and entertainment for news reporting. Many have blurred this distinction on purpose, and I worry that fewer and fewer people know the difference, or care to know the difference. Life is a bit faster paced than it was even 20 years ago, and many who are feeling a bit overwhelmed just want to hear what they want to hear, if you know what I mean. Or as a friend used to say, “Simple thoughts for simple minds”. No, I really do not want to ask that question Cyndy. Thanks for the comment, Cyndy — although I typically only source the NYT when I am beating up on them about something :-) but your point is well taken. I respect the Times does a lot, and I wouldn’t want to see it go away, but I don’t think aggregation (as opposed to plagiarism) means that the NYT won’t exist any more. It will just have to learn how to adapt. And as for valuations, things are worth what people are willing to pay for them — no more, and no less — not what we think people should pay for them. Set aside the moral issues and no one has any doubt about about why the “big valuations” are going to the aggregators. They create more traffic and spin more ads for less invested capital than do traditional news outlets. Whatever your religious feelings about what Mr. Keller produces vs. Huffpo or anyone else, what he does costs a lot more money to produce than what Ms. Huffington does. Couple that with a better social distribution model than The Times, and she’s been able to derive more revenue per head count (the most important metric, in my mind, for any online business–just ask Matt Drudge) than Mr. Keller ever could. But it won’t last forever. 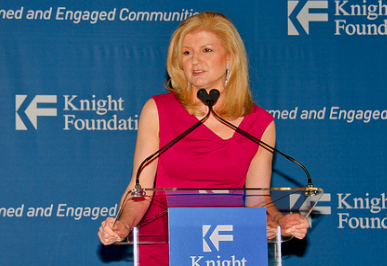 As her ambitions for original reporting rise, AOL’s stock price will fall accordingly. If AOL is smart, they’ll keep her journalistic ambitions in check for the sake of the business.